The Czech Republic (also Czechia since 2016) is a country in central Europe. Its capital is Prague. It was formed in 1993 from the western part of Czechoslovakia. The Czech Republic is a member of NATO, joining in 1999 and the European Union, joining in 2004. It has become one of the most stable former communist economies of eastern Europe, because the economy removed price controls, sold many of the publicly owned companies and kept strict fiscal policies to limit deficits. By 2018, it had developed a strong economy due to its high-tech industry and low taxes. The majority of the 10.6 million inhabitants of the Czech Republic are ethnically and linguistically Czech (95%). Other ethnic groups include Germans, Roma, and Poles. After the 1993 division of the Czech and Slovak Federal Republic, some Slovaks remained in the Czech Republic and comprise roughly 3% of the current population. The border between the Czech Republic and Slovakia is open for citizens of the former Czechoslovakia. Laws establishing religious freedom were passed shortly after the revolution of 1989, lifting oppressive regulations enacted by the former communist regime. Major denominations and their estimated percentage populations are Roman Catholic (11%) and Protestant (1%). A large percentage of the Czech population are irreligious (35%), and 16% describe themselves as uncertain. The Jewish community numbers a few thousand today; a synagogue in Prague memorializes the names of more than 80,000 Czechoslovak Jews who perished in World War II. 30% of the Czech Republic's inhabitants are atheists. Ethnic groups: Czech (90.4% or 9.25 million); Moravian (more than 380,000); Slovak (193,000); Roma (171,000); Silesian (11,000); Polish (52,000); German (39,000); Ukrainian (22,000); and Vietnamese (18,000). Health: Life expectancy—males 72.3 yrs., females 78.5 yrs. Work force (5.17 million): Industry, construction, and commerce—40%; government and other services—56%; agriculture—4%. Vaclav Klaus was from 2003 to 2013 the President of the Czech Republic . He was elected on February 28, 2003 and sworn into office on March 7, 2003. As formal head of state, the president is granted specific powers such as the right to nominate Constitutional Court judges, dissolve parliament under certain conditions, and enact a veto on legislation. Presidents are elected by the parliament for 5-year terms. The legislature is bicameral, with a Chamber of Deputies (200 seats) and a Senate (81 seats). With the split of the former Czechoslovakia, the powers and responsibilities of the now-defunct federal parliament were transferred to the Czech National Council, which renamed itself the Chamber of Deputies. Chamber delegates are elected from 14 regions—including the capital, Prague—for 4-year terms, on the basis of proportional representation. The Czech Senate is patterned after the U.S. Senate and was first elected in 1996; its members serve for 6-year terms with one-third being elected every 2 years. The June 2–3, 2006 general election resulted in the Chamber of Deputies' 200 seats being evenly divided 100-100 between three center-right parties and two parties on the left, with neither side able to form a majority government. The impasse led to months of protracted negotiations during which Prime Minister Mirek Topolanek formed a three-party coalition with the Christian Democrats (KDU-CSL) and the Greens (SZ). The coalition lost its first vote of confidence 96-99 on October 4, 2006. But some seven months after the election, on January 19, 2007, the coalition succeeded in its second attempt when two renegade parliamentarians from the opposition Social Democrats (CSSD) abstained. When the Berlin Wall fell in 1989 it meant that the Soviet Union was no longer in charge. The Communist satellite dictatorships of eastern Europe all fell in a matter of weeks—and Russia's collapsed in 1991. All the Communist parties of eastern Europe transformed themselves after 1989 into more mainstream center-left parties. One exception was in the Czech Republic where the Communist Party refused to undertake a comprehensive overhaul. It gained nearly 13% of the vote in the last parliamentary elections in 2006. Its supporters are mostly those fed up with politics as usual and regime nostalgics, many of them elderly pensioners, for whom life before 1989 seemed better than it does today. From 2003 to 2013 Vaclav Klaus was President of the Czech Republic. He knows that belief in "global warming" is a threat to freedom, democracy, the market economy and prosperity. In June 2017, the Czech Parliament voted overwhelmingly to add a constitutional right to bear weapons in the nation's constitution. From 1948 until 1989, the foreign policy of Czechoslovakia followed that of the Soviet Union. Since independence, the Czechs have made integration into Western institutions their chief foreign policy objective. The Czech Republic became a member of the North Atlantic Treaty Organization, along with Poland and Hungary, on March 12, 1999. The Czech Republic became a full member of the European Union on May 1, 2004. Both events are milestones in the country's foreign policy and security orientation. The Czech Republic is scheduled to host the rotating EU Presidency during the first half of 2009. The Czech Republic is a member of the United Nations and participates in its specialized agencies. It is a member of the World Trade Organization. It maintains diplomatic relations with more than 85 countries, of which 80 have permanent representation in Prague. The Czech Republic has made a significant contribution to the War on Terrorism relative to its size. It deployed a nuclear/biological/chemical (NBC) defense unit in support of Operation Enduring Freedom (OEF) and a field hospital in support of the International Security Assistance Force (ISAF) in Afghanistan. When the U.S. intervened in Iraq, the Czechs moved their field hospital from Afghanistan to Basra and deployed an NBC unit to Kuwait. Both the field hospital and the NBC unit have left Iraq. In April 2004, the Czech Government deployed a Special Forces unit to OEF in Afghanistan, and a group of specialists to ISAF. The Special Forces unit returned to the Czech Republic in September 2004. In March 2005, the Czechs deployed military reconnaissance troops to serve with a German-led Provincial Reconstruction Team under ISAF. The parliament has approved the following 2007 deployments of over 1,000 troops in missions to Iraq, Afghanistan, the Balkans, and Lebanon, as well as additional troops to the NATO Response Force. Iraq: 99 soldiers at a multinational force (MNF) base close to the City of Basra where they conduct police training. Five soldiers are also serving at the International Command of the NATO Training Mission in Baghdad. Afghanistan: 148 deployed; roughly 150 more could be deployed in 2007. Sixty-six are in Kabul where the Czechs have command of the International Airport (KAIA), under the NATO-led ISAF. Another 82 soldiers are in Faizabad province serving the multinational Provincial Reconstruction Team (PRT). At the 2006 NATO summit in Riga, President Klaus announced plans for the deployment of an additional 70 soldiers, including 35 military police for operations in the south, 10 additional chem-bio troops, and 25 reinforcements for the PRT in Faizabad. In February 2007, the Senate and the Chamber of Deputies approved the deployment of a 70-man field hospital, which began deployment in March 2007. They also approved an additional deployment of a specially trained police unit to operate in support of U.K. forces in southern Afghanistan. This deployment occurred in spring 2007. Kosovo: The Czech Republic has had troops in Kosovo since 1999. The 10th rotation of troops arrived in January 2007. There are currently 394 soldiers doing peacekeeping under NATO KFOR. The biggest element of this group comes from the 42nd Mechanized Battalion at Tabor. Bosnia and Herzegovina: 52 troops under an EU mission: 48 at a base in Tuzla, 4 in Sarajevo. Lebanon: Authorization for 10 troops to join the UNIFIL mission. The Czech Republic became a member of the North Atlantic Treaty Organization (NATO) on March 12, 1999. A major overhaul of the Czechoslovak defense forces began in 1990 and continues in the Czech Republic. Czech forces are being downsized from 200,000 to approximately 35,000, and at the same time reoriented toward a more mobile, deploy-able force structure. The Czechs have made good progress in reforming the military personnel structure, and a strong commitment to English-language training is paying off. Compulsory military service ended in December 2004. Public support for NATO membership remains around 50%-60%. The Czech Government currently spends slightly less than 2% of GDP on defense. This puts Czech defense spending on a par with the European NATO average. The Czech Republic has good to excellent relations with all of its neighbors, and none of its borders are in question. The Czech Republic is a member of the UN and OSCE and has contributed to numerous peacekeeping operations, including IFOR/SFOR in Bosnia and KFOR in Kosovo, as well as Desert Shield/Desert Storm and Enduring Freedom. Of the former communist countries in central and eastern Europe, the Czech Republic has one of the most developed and industrialized economies. Its strong industrial tradition dates to the 19th century, when Bohemia and Moravia were the industrial heartland of the Austro-Hungarian Empire. The Czech Republic has a well-educated population and a well-developed infrastructure. The country's strategic location in Europe, low-cost structure, and skilled work force have attracted strong inflows of foreign direct investment (FDI). This investment is rapidly modernizing its industrial base and increasing productivity. The principal industries are motor vehicles, machine-building, iron and steel production, metalworking, chemicals, electronics, transportation equipment, textiles, glass, brewing, china, ceramics, and pharmaceuticals. The main agricultural products are sugar beets, fodder roots, potatoes, wheat, and hops. As a small, open economy in the heart of Europe, economic growth is strongly influenced by demand for Czech exports and flows of foreign direct investment. At the time of the 1948 communist takeover, Czechoslovakia had a balanced economy and one of the higher levels of industrialization on the continent. In 1948, however, the government began to stress heavy industry over agricultural and consumer goods and services. Many basic industries and foreign trade, as well as domestic wholesale trade, had been nationalized before the communists took power. Nationalization of most of the retail trade was completed in 1950-51. Natural resources: Coal, coke, timber, lignite, uranium, magnesite. Agriculture: Products—wheat, rye, oats, corn, barley, hops, potatoes, sugar beets, hogs, cattle, horses. Industry: Types—motor vehicles, machinery and equipment, iron, steel, cement, sheet glass, armaments, chemicals, ceramics, wood, paper products, and footwear. Trade (2006): Exports--$94.8 billion (est. ): motor vehicles, machinery, iron, steel, chemicals, raw materials, consumer goods. Imports--$92.9 billion (est.). Trading partners—Germany (32%), Slovakia, Poland, France, Austria, Italy, the Netherlands, Russia, U.K., China, United States. The "Velvet Revolution" in 1989 offered a chance for profound and sustained economic reform. Signs of economic resurgence began to appear in the wake of the shock therapy that the International Monetary Fund (IMF) labeled the "big bang" of January 1991. Since then, astute economic management has led to the elimination of 95% of all price controls, large inflows of foreign investment, increasing domestic consumption and industrial production, and a stable exchange rate. Exports to former communist economic bloc markets have shifted to western Europe. Thanks to foreign investment, the country enjoys a positive balance-of-payments position. Despite a general trend over the last 10 years toward rising budget deficits, the Czech Government's domestic and foreign indebtedness remains relatively low. The Czech koruna (crown) became fully convertible for most business purposes in late 1995. Following a currency crisis and recession in 1998-99, the crown exchange rate was allowed to float. Recently, strong capital inflows have resulted in a steady increase in the value of the crown against the euro and the dollar. The strong crown helped to keep inflation low. In 2004, inflation was about 2.8%, mainly due to increases in value added tax rates and higher fuel costs, and dropped to 1.9% in 2005. It hovered around 2.5% in 2006. The Ministry of Finance forecasts a rate of 2.4% for 2007. The Czech Republic will not adopt the euro earlier than 2012. The Czech Republic is gradually reducing its dependence on highly polluting low-grade brown coal as a source of energy, in part because of EU environmental requirements. In 2005, according to the Czech Statistical Office, 65.4% of electricity was produced in steam, combined, and combustion power plants; 30% in nuclear plants; and 4.6% from renewable sources, including hydro power. Russia (via pipelines through Ukraine) and, to a lesser extent, Norway (via pipelines through Germany) supply the Czech Republic with liquid and natural gas. The government has offered investment incentives in order to enhance the Czech Republic's natural advantages, thereby attracting foreign partners and stimulating the economy. Shifting emphasis from the East to the West has necessitated adjustment of commercial laws and accounting practices to fit Western standards. Formerly state-owned banks have all been privatized into the hands of west European banks and oversight by the central bank has improved. The telecommunications infrastructure has been upgraded and the sector is privatized. The Czech Republic has made significant progress toward creating a stable and attractive climate for investment, although continuing reports of corruption are troubling to investors. Its success allowed the Czech Republic to become the first post-communist country to receive an investment-grade credit rating by international credit institutions. Successive Czech governments have welcomed U.S. investment in addition to the strong economic influence of Western Europe and increasing investment from Asian auto manufacturers. Inflows of foreign direct investment in 2005 were $11.7 billion, more than double the previous year. In 2006, FDI dropped back to previous levels at roughly $6 billion. By U.S. Embassy estimates, the United States is among the top five investors in the Czech Republic since the revolution. The Czech Republic boasts a flourishing consumer production sector. In the early 1990s most state-owned industries were privatized through a voucher privatization system. Every citizen was given the opportunity to buy, for a moderate price, a book of vouchers that he or she could exchange for shares in state-owned companies. State ownership of businesses was estimated to be about 97% under communism. The non-private sector is less than 20% today. Unemployment declined to 7.7% in 2006. Rates of unemployment are higher in the coal and steel producing regions of Northern Moravia and Northern Bohemia, and among less-skilled and older workers. The economy grew 6.1% in 2005 and experienced similar growth in 2006. The current right-of-center coalition government has committed itself to reducing the deficit to 3% of GDP by 2008, from 4.7% in 2006. Planned reforms involving reduction of currently mandatory expenditures to meet Maastricht criteria for adoption of the euro will prepare the Czech Republic for accession to the euro zone in 2012 at the earliest. The Czech Republic became a European Union (EU) member on May 1, 2004. Most barriers to trade in industrial goods with the EU fell in the course of the accession process. The process of accession had a positive impact on reform in the Czech Republic, and new EU directives and regulations continue to shape the business environment. Free trade in services and agricultural goods, as well as stronger regulation and rising labor costs, will mean tougher competition for Czech producers. Future levels of EU structural funding and agricultural supports were key issues in the accession negotiations. Even before accession, policy set in Brussels had a strong influence on Czech domestic and foreign policy, particularly in the area of trade. The Czech Republic’s economic transformation is not yet complete. The government still faces serious challenges in completing industrial restructuring, increasing transparency in capital market transactions, transforming the housing sector, reforming the pension and health care systems, and solving serious environmental problems. 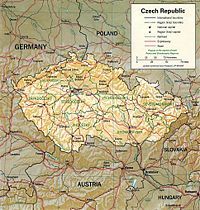 The Czech Republic was the western part of the Czech and Slovak Federal Republic. Formed into a common state after World War I (October 28, 1918), the Czechs, Moravians, and Slovaks remained united for almost 75 years. On January 1, 1993, the two republics peacefully split to form two separate states. The Czechs lost their national independence to the Hapsburg Empire in 1620 at the Battle of White Mountain and for the next 300 years were ruled by the Austrian Monarchy. With the collapse of the monarchy at the end of World War I, the independent country of Czechoslovakia was formed, encouraged by, among others, President Woodrow Wilson. Despite cultural differences, the Slovaks shared with the Czechs similar aspirations for independence from the Hapsburg state and voluntarily united with the Czechs. For historical reasons, Slovaks were not at the same level of economic and technological development as the Czechs, but the freedom and opportunity found in Czechoslovakia enabled them to make strides toward overcoming these inequalities. However, the gap never was fully bridged, and the discrepancy played a continuing role throughout the 75 years of the union. Although Czechoslovakia was the only east Central European country to remain a parliamentary democracy from 1918 to 1938, it was plagued with minority problems, the most important of which concerned the country's large immigrant German population. Constituting more than 22% of the interwar state's population and largely concentrated in the Bohemian and Moravian border regions (the Sudetenland), members of this minority, including some who were sympathetic to Nazi Germany, undermined the new Czechoslovak state. Internal and external pressures culminated in September 1938, when France and the United Kingdom yielded to Nazi pressures at Munich and agreed to force Czechoslovakia to cede the Sudetenland to Germany breaking their alliances with it. Fulfilling Hitler's aggressive designs on all of Czechoslovakia, Germany invaded what remained of Bohemia and Moravia in March 1939, establishing a German "protectorate." By this time, Slovakia had already declared independence and had become a puppet state of the Germans. Hitler’s occupation of the Czech lands was a clear betrayal of the Munich Pact and still stirs passions in modern-day Czech society, but at the time it was met by muted resistance; the brunt of Nazi aggression was felt by Czech Jews and other non-German populations who were rounded up and deported to concentration camps in systematic waves. Over 100,000 Jews lived in the Czech lands in 1939. Only several thousand remained or returned after the Holocaust in 1945. At the close of World War II, Soviet troops overran all of Slovakia, Moravia, and much of Bohemia, including Prague. In May 1945, U.S. forces liberated the city of Plzen and most of western Bohemia. A civilian uprising against the German garrison took place in Prague in May 1945. Following Germany's surrender, some 2.9 million ethnic Germans were expelled from Czechoslovakia with Allied approval under the Benes Decrees. Reunited after the war, the Czechs and Slovaks set national elections for the spring of 1946. The democratic elements, led by President Eduard Benes, hoped the Soviet Union would allow Czechoslovakia the freedom to choose its own form of government and aspired to a Czechoslovakia that would act as a bridge between East and West. The Czechoslovak Communist Party, which won 38% of the vote, held most of the key positions in the government and gradually managed to neutralize or silence the anti-communist forces. Although the communist-led government initially intended to participate in the Marshall Plan, it was forced by Moscow to back out. Under the cover of superficial legality, the Communist Party seized power through a coup in February 1948. After extensive purges modeled on the Stalinist pattern in other east European states, the Communist Party tried 14 of its former leaders in November 1952 and sentenced 11 to death. For more than a decade thereafter, the Czechoslovak communist political structure was characterized by the orthodoxy of the leadership of party chief Antonin Novotny. The communist leadership allowed token reforms in the early 1960s, but discontent arose within the ranks of the Communist Party central committee, stemming from dissatisfaction with the slow pace of the economic reforms, resistance to cultural liberalization, and the desire of the Slovaks within the leadership for greater autonomy for their republic. This discontent expressed itself with the removal of Novotny from party leadership in January 1968 and from the presidency in March. He was replaced as party leader by a Slovak, Alexander Dubcek. After January 1968, the Dubcek leadership took practical steps toward political, social, and economic reforms. In addition, it called for politico-military changes in the Soviet-dominated Warsaw Pact and Council for Mutual Economic Assistance. The leadership affirmed its loyalty to socialism and the Warsaw Pact but also expressed the desire to improve relations with all countries of the world regardless of their social systems. A program adopted in April 1968 set guidelines for a modern, humanistic socialist democracy that would guarantee, among other things, freedom of religion, press, assembly, speech, and travel; a program that, in Dubcek's words, would give socialism "a human face." After 20 years of little public participation, the population gradually started to take interest in the government, and Dubcek became a truly popular national figure. The internal reforms and foreign policy statements of the Dubcek leadership created great concern among some other Warsaw Pact governments. On the night of August 20, 1968, Soviet, Hungarian, Bulgarian, East German, and Polish troops invaded and occupied Czechoslovakia. The Czechoslovak Government immediately declared that the troops had not been invited into the country and that their invasion was a violation of socialist principles, international law, and the UN Charter. The principal Czechoslovak reformers were forcibly and secretly taken to the Soviet Union. Under obvious Soviet duress, they were compelled to sign a treaty that provided for the "temporary stationing" of an unspecified number of Soviet troops in Czechoslovakia. Dubcek was removed as party First Secretary on April 17, 1969, and replaced by another Slovak, Gustav Husak. Later, Dubcek and many of his allies within the party were stripped of their party positions in a purge that lasted until 1971 and reduced party membership by almost one-third. The 1970s and 1980s became known as the period of "normalization," in which the apologists for the 1968 Soviet invasion prevented, as best they could, any opposition to their conservative regime. Political, social, and economic life stagnated. The population, cowed by the "normalization," was quiet. The roots of the 1989 Civic Forum movement that came to power during the "Velvet Revolution" lie in human rights activism. On January 1, 1977, more than 250 human rights activists signed a manifesto called the Charter 77, which criticized the government for failing to implement human rights provisions of documents it had signed, including the state's own constitution; international covenants on political, civil, economic, social, and cultural rights; and the Final Act of the Conference for Security and Cooperation in Europe. Although not organized in any real sense, the signatories of Charter 77 constituted a citizens' initiative aimed at inducing the Czechoslovak Government to observe formal obligations to respect the human rights of its citizens. On November 17, 1989, the communist police violently broke up a peaceful pro-democracy demonstration and brutally beat many student participants. In the days that followed, Charter 77 and other groups united to become the Civic Forum, an umbrella group championing bureaucratic reform and civil liberties. Its leader was the dissident playwright Vaclav Havel. Intentionally eschewing the label "party," a word given a negative connotation during the previous regime, Civic Forum quickly gained the support of millions of Czechs, as did its Slovak counterpart, Public Against Violence. Faced with an overwhelming popular repudiation, the Communist Party all but collapsed. Its leaders, Husak and party chief Milos Jakes, resigned in December 1989, and Havel was elected President of Czechoslovakia on December 29. The astonishing quickness of these events was in part due to the unpopularity of the communist regime and changes in the policies of its Soviet guarantor as well as to the rapid, effective organization of these public initiatives into a viable opposition. Civic Forum found, however, that although it had successfully completed its primary objective—the overthrow of the communist regime—it was ineffectual as a governing party. The demise of Civic Forum was viewed by most as necessary and inevitable. By the end of 1990, unofficial parliamentary "clubs" had evolved with distinct political agendas. Most influential was the Civic Democratic Party, headed by Vaclav Klaus, who later became Prime Minister. Other notable parties that came to the fore after the split were the Czech Social Democratic Party, Civic Movement, and Civic Democratic Alliance. By 1992, Slovak calls for greater autonomy effectively blocked the daily functioning of the federal government. In the election of June 1992, Klaus's Civic Democratic Party won handily in the Czech lands on a platform of economic reform. Vladimir Meciar's Movement for a Democratic Slovakia emerged as the leading party in Slovakia, basing its appeal on fairness to Slovak demands for autonomy. Federalists, like Havel, were unable to contain the trend toward the split. In July 1992, President Havel resigned. In the latter half of 1992, Klaus and Meciar hammered out an agreement that the two republics would go their separate ways by the end of the year. Members of the federal parliament, divided along national lines, barely cooperated enough to pass the law officially separating the two nations. The law was passed on December 27, 1992. On January 1, 1993, the Czech Republic and the Slovak Republic were simultaneously and peacefully founded. Relationships between the two states, despite occasional disputes about the division of federal property and governing of the border, have been peaceful. Both states attained immediate recognition from the U.S. and their European neighbors. ↑ Williams, Thomas D. (June 30, 2018). Czech Republic’s Economic Boom Credited to High Tech, Low Taxes. Breitbart News. Retrieved June 30, 2018. ↑ Tomlinson, Chris (June 29, 2017). Czech Republic Parliament Passes Constitutional Right to Bear Arms. Breitbart News. Retrieved June 30, 2017. Jiri Hochman. Historical Dictionary of the Czech State. (1998). 242 pp. This page was last modified on 26 September 2018, at 10:07. This page has been accessed 26,481 times.